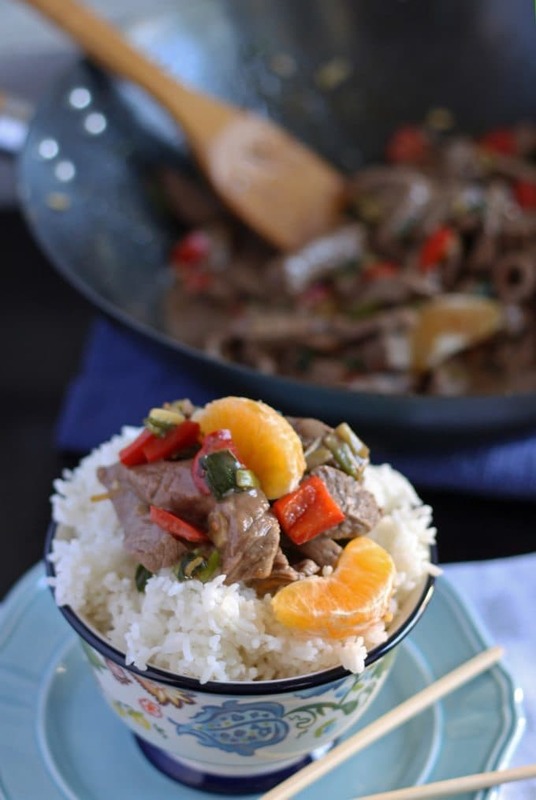 This mandarin orange beef stir fry recipe is not only delicious, it is also dairy free! Try it out for dinner tonight! This recipe was originally published on May 16, 2013. It has been updated with more details and new pictures. Last year, Mr. B and I had to go on a dairy-free diet for 2 months – doctors orders. It was not easy for us cheese lovin’ freaks. Mostly we just ate vegetables and bread. This recipe was my first (and almost only) foray into the dairy-free food zone. If we were going to have to stay dairy-free, I was going to have to get good at cooking without the ingredients I am used to. I never got quite comfortable – no dairy-free cream cheese frosting for me. Vegans are quite amazing with their cooking abilities. I’m still feeling a little uncomfortable making something complicated but I went out and bought some ingredients and I hope to spend some time one day, experimenting. Back then, we went to Whole Foods, Jewel and Trader Joe’s and picked up a bunch of different dairy free foods. I got really good at reading the labels on food – my advice to you is read carefully. I bought some frozen vegetables and found out when I got home that there was dairy in the bag. Somewhere. Still not sure because there wasn’t a sauce of any kind but oh well – I got to eat a whole bag of veggies for dinner and then I made something else for Mr. B. 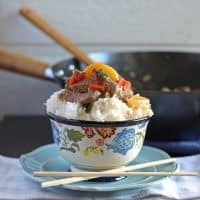 This recipe is great – the original beef stir fry recipe used tangerines and gives a bunch of options to go gluten-free. I like mandarin oranges, so I used mandarin oranges and I always like to add a little spice. Prep all of your veggies before you get started, and get your rice started too. Chop your green onions, peel and chop your ginger, and slice your bell peppers. Zest and juice 1 orange, juice another orange (keep the juice separate and on the side), and peel and section up 2 more. Then slice up your beef and you’re ready to go. We did buy the beef at Whole Foods instead of our normal grocery store because we were worried about the possibility of weird dairy injections in the meat. Believe it or not, from my research, I believe it could happen. Combine the scallions, ginger, bell peppers, orange zest and juice in a bowl. Add the cornstarch and then the beef. Mix well to coat the beef. 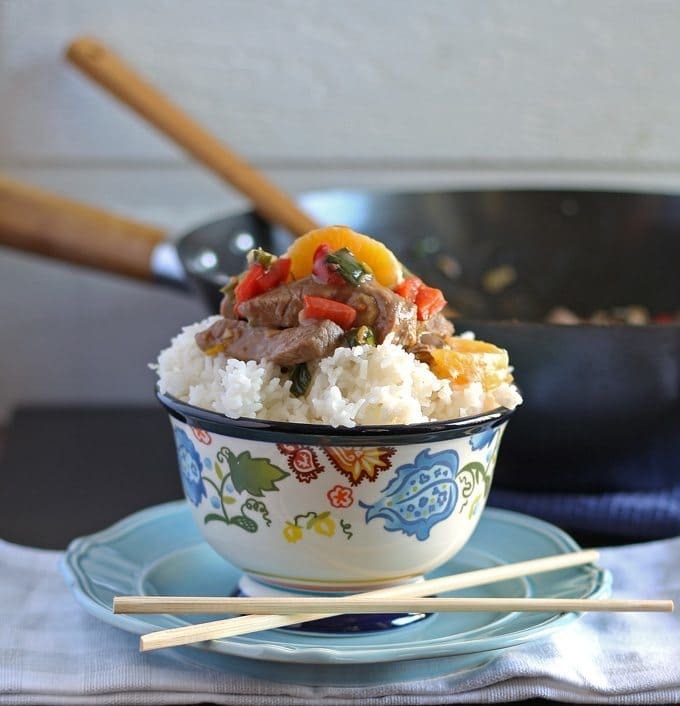 Heat your wok or skillet over medium-high heat. Meanwhile, combine the remaining orange juice, soy sauce, honey and crushed red pepper in a large bowl until well combined. Set aside. 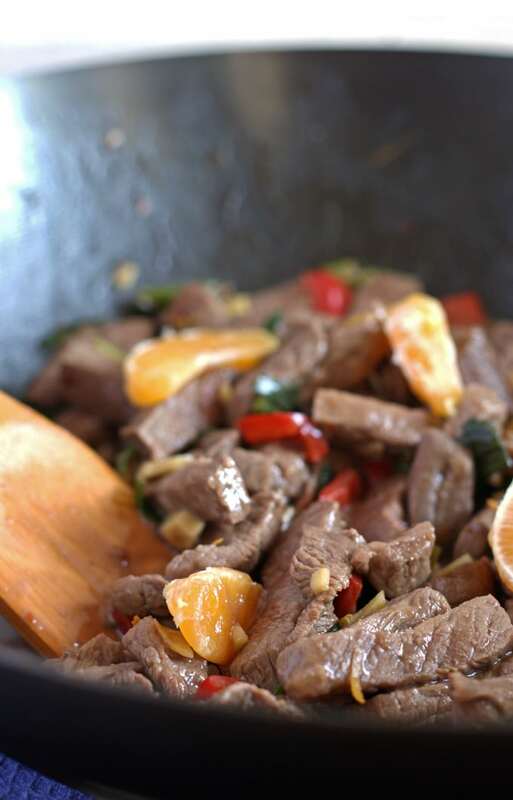 Add the vegetable oil to your heated wok and add the beef mixture to the pan. Cook and stir constantly until the beef is brown. Add the soy sauce/honey mixture and keep on heat until the sauce is thickened. Remove from heat, add the mandarin orange segments, toss and serve over rice. 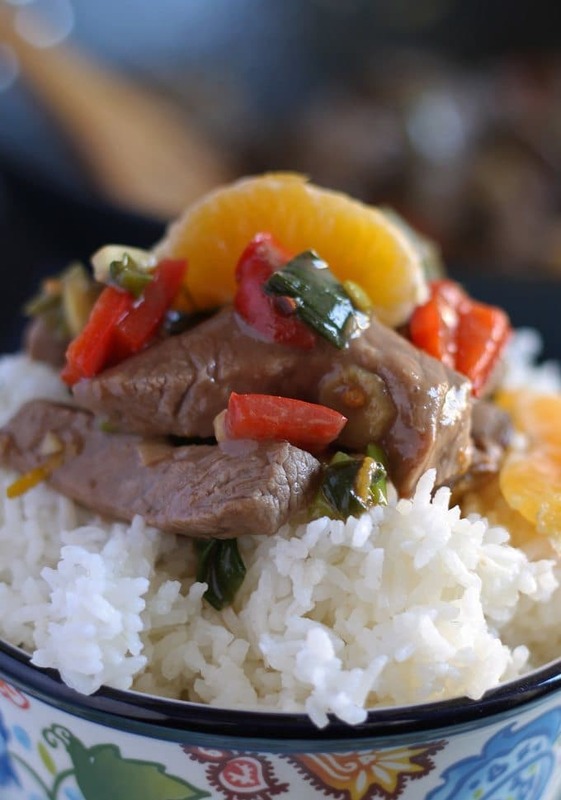 I’ve never tried mandarin oranges in stir-fry before but it looks amazing! the combination looks really good, and i think the taste would be the same! Thanks FJ – I hope you try it – its yummy! Thank you Alyssa! As long as you only include one photo and link to the original post, you can share it on your site. I appreciate that you reached out. Have a great week!